Today, officials are expected to unveil new proposals that will redefine women’s football in Argentina. It is a modest start, but nonetheless a positive one – and it vindicates those who have pushed hard for equal treatment. In 1934, Argentine football changed forever. After years of wrangling, strikes, underthe-table payments and even breakaway leagues, the decision was made to professionalise the sport, ending the conflict that had threatened to tear the Primera División in twain. Now, just short of 85 years later, the women that represent some of the nation’s top clubs with pride on the pitch look set to take that same step, in what can only be interpreted as a huge victory for those who pushed and keep pushing for equal treatment with the men’s game. Today, the Argentine Football Association (AFA) is expected to announce a radical overhaul of its top women’s league. Early reports suggest that the 18 clubs of the Primera División will receive a sum of roughly 24 million pesos in order to sign between eight and 11 players to professional contracts. This will not, of course, guarantee riches for those involved. Each player awarded a contract is likely to receive a monthly salary of up to 15,000 pesos (just shy of US$400), in line with the minimum wage stipulated for a fourth-tier Primera C Division player in the men’s game. It is a modest start, but a positive one. The fight for professionalism picked up major attention towards the end of 2018. 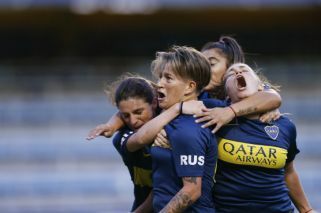 It has been a collective effort across the women’s game which has also drawn in wide support from Argentina’s burgeoning feminist movement. But if one had to put a single face on the battle, that face would belong to Macarena Sánchez. The Santa Fe-born forward, 27, has since 2012 been one of the stars of women’s heavyweights UAI Urquiza, helping the side to three national titles as well as a third-place finish in the Copa Libertadores. At the start of the current year, though, Sánchez was unceremoniously dumped by UAI, and was further informed that she was banned from seeking another club until t he 2 018 -2 019 season came to an end. The player responded w i t h a subpoena de - manding compensation for her seven years at the club and the restoration of her legal right to work, a move that targeted not just the club but AFA as a whole. A tidal wave had been set in motion that rocked the football world. “The clubs and the Argentinian Football Federation do not recognise us as workers and deny us basic rights such as a salary, something that men do receive for playing football, and other basic things and tools that any high-performance athlete needs: places to train, shoes, m e d i c a l c o v e r a g e a n d clothing, to name a few,” Sánchez stated in a subsequent interview with British newspaper The Guardian. Under the banner of Fútbol Femenino Profesional (“Professional Women’s Football”) the campaign for equal treatment has been a runaway success. 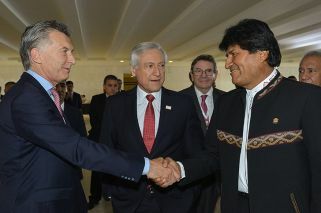 Public figures such as rock star Indio Solari and former president Cristina Fernández de Kirchner have lent their support, as have countless footballers in Argentina and beyond. But the battle has also taken its toll on those involved. Sánchez has been targeted repeatedly in social media attacks (as recently as this week) and even received death threats, all the while refusing to be cowed by the hostility – a testament to the young forward’s bravery and convictions. Just a week before AFA president Claudio Tapia’s expected announcements, the game broke new ground in La Boca. For the first time ever, the Xeneize’s women’s side took the field at the Bombonera, this time prior to a men’s game, thrashing Lanús 5-0 in a memorable clash. There is certainly s t i l l a l o n g r o a d a h e a d , b u t g r e a t s te p s h ave b e en taken in a few short months and it will become harder and harder to stop the mom e n t u m a s Argentina’s women footballers de - mand justice and equality.